What Outlander Taught Me About Writing. If you are not acquainted with the Outlander books and Starz series here’s a quick rundown. The first of the 8 books was published in 1992. The TV series first aired in 2014 and is now in the 4th season. It’s about a woman, the Sassy Sassenach, who sets her clocks back too far and lands up in 18th century Scotland. Her goal is the get back to the 20th century. But there is a hot Scot, Kilt Daddy, whose goal is to keep her there. Her motivation is to get back to hot baths and toilet paper. His motivation is love. He loved her from the moment he saw her. Sigh. Conflict is behind every bush. Redcoats waring with Highland Clans. Waring 20th and 18th century morals and values. I could go on but think you get the point. I’ll begin by saying I feel the Starz series does a good job of transferring the book to the screen. I don’t agree with all the changes they’ve made but, no one asked me for my opinion. I believe no two people read the same book or see the same TV show. We read/watch with our own POV. Our world views and experiences. Everyone’s mileage differs. This is my perspective. The author, Diana Gabaldon, intrigues me most with her characters emotional connections and journeys. Everything between tender to brutal, funny to heartbreak is on the page. Her intimate scenes are more about emotions than the physicality. Gabaldon weaves her fiction around historical events. She immerses her characters in actual places and events. To the point the settings and events become characters. When the very name of a place is mentioned a reader is able to conjure up the image. Not so much because of complicated physical details but because of the addition of sensual details. I’d venture to say everyone knows what a rock wall or tree looks like. But a rock wall with lichen the same as covered the grave stones. Or the oak tree live the one he’s carved their initials in. We are frequently treated to 18th medical practices and all manner of lotions and potions that are used today. There is an Outlander Kitchen Cookbook. Do you remember in a Breath of Snow and Ashes when the kiddos get into the Cherry Bounce? There is very little about taste. There is plenty about the effects. The reactions of the unaffected. The reader can’t help but smile. I think it tastes like industrial strength cough syrup. As the family grows so do sub plots. The reader becomes as deeply involved with secondary characters as they are the main characters. Every single character elicits emotional responses from me. When Fergus had his hand severed. O. MY. The death of a beloved child. Some characters we absolutely hate. These books have many villains. They cause emotional and physical havoc. Secondary characters are popular enough to spawn character spinoff novellas. I adore the way this author uses animals as characters. Ian’s dog. The family mule. Sassy Sassenach’s chitty. Kilt Daddy’s horses. They have their own personalities. Their interactions with humans is amazing. The readers become emotionally vested in the animal’s stories. Okay, I’ve rambled long enough. My point I’m trying to make is the story isn’t simply being told. I feel I know Kilt Daddy, Sassy Sassenach, their family and their connections to each other. When something happens to them I feel it. I have an emotional connection to people, places and animals in this book. How does Outlander speak to you? Does it give you ideas to improve your writing? War heroes come in many sizes shapes and species. Yeaph! Species. There are many animal war heroes. I believe we are most familiar with military working dogs (MWD) and K9 officers. Dogs have been in warfare since ancient times used as scouts, sentries and trackers. They sniff out explosive devises saving countless lives. They are assigned to safe guard generals and political personnel on visits outside the country. They’ve suffered severe trauma, lost limbs and been honored for their bravery with medals. Layka, a Belgian Malinois, was shot four times at point-blank range by enemy forces in Afghanistan. Despite her injuries, she attacked and subdued the shooter, protecting her handler, and other members of the team. Photographer, Martin Schoeller, did an amazing photoshoot of Layka, the now three-legged dog, for National Geographic. I’d love to share his photos here but I don’t have permission. This is the link to his page to see this brave beautiful dog. He wandered into the training encampment of the Massachusetts of 102nd infantry in 1917. When the unit shipped out to France, Stubby was smuggled aboard ship. On the battle field, the dog alerted his friends to German attacks. He was wounded by a hand grenade, gassed several times, and once found and held a German spy by the seat of the pants until the troops could complete the capture. When his master was wounded, Stubby accompanied him to the hospital and made rounds to cheer the troops. Sgt. 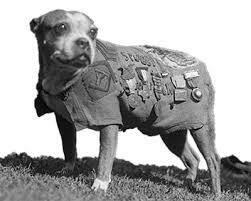 Stubby survived the war and Gen. John Pershing, personally awarded him a gold medal for one of his many efforts. He became a highly decorated dog, among his medals a Purple Heart, and various veteran’s awards. Stubby returned home at the end of the war and became quite the celebrity. He was made a lifetime member of the American Legion, the YMCA, and the Red Cross. He lived at the Y and made recruiting tours for the Red Cross. Stubby passed on in 1926, he was preserved and displayed with his medals at the Smithsonian Institution. She served with the Recoilless Rifle Platoon, Anti-Tank Company, 1st Marine Division, was bought for $250 at a race track in Seoul during the war. The marines taught her to walk over trip wires, avoid incoming enemy fire and deliver huge packs of ammunition during battle. During the five day Battle of Outpost Vegas in 1953 in one day she made 51 solo—that’s by herself— trips from the Ammunition Supply Point to the firing sites. Marine Corps history say this battle was particularly savage and Reckless was in the middle of it. Enemy soldiers could see her as she made her way across the deadly “no man’s land” rice paddies and up 45-degree mountain trails to the firing sites. 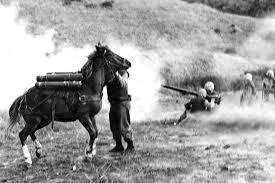 “It’s difficult to describe the elation and the boost in morale that little white-faced mare gave Marines as she outfoxed the enemy—remember she was on her own—bringing vitally needed ammunition up the mountain,” Sgt. Maj. James E. Bobbitt recalled. She carried 386 rounds of ammunition (over 9,000 pounds – almost FIVE TONS! — of ammunition), walked over 35 miles through open rice paddies and up steep mountains with enemy fire coming in at the rate of 500 rounds per minute. She would carry wounded soldiers down the mountain, unload them, get reloaded with ammo, and off she would go back up to the guns. She also provided a shield for several Marines who were trapped trying to make their way up to the front line. Wounded twice, she didn’t let that stop or slow her down. Her heroics defined the word “Marine.” She was BELOVED by the Marines. They took care of her better than they took care of themselves – throwing their flak jackets over her to protect her when incoming was heavy, risking their own safety. Her Military Decorations include two Purple Hearts, Good Conduct Medal, Presidential Unit Citation with star, National Defense Service Medal, Korean Service Medal, United Nations Service Medal, Navy Unit Commendation, and Republic of Korea Presidential Unit Citation. There is a book about Sgt. Reckless. She has a face book page and she has a bronze statue. Okay I find this one really well, odd. 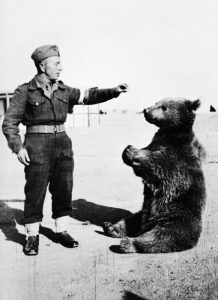 But Wojtek the bear was bought and adopted by Polish soldiers making their way back east after they were released from a prison camp in Siberia in 1942. When the unit re-entered the war the only way they could take Wojtek with them was to make him an official soldier. So he became Corporal Wojtek of the artillery supply unit. Wojtek fit in quite well—his favorite activities included wrestling, drinking beer, and Taking showers. The 440-pound bear became an ammo carrier that ferried heavy artillery rounds to the guns and he was good at his job. His finest hour came during the Battle of Monte Cassino, when he loaded 100-pound boxes of artillery shells into trucks all day long, every day until the battle was won. The army honored Wojtek’s service by putting his image, carrying ammo, on the unit’s official badge. After the war, Wojtek was housed at the Edinburgh Zoo until his death in 1963. Then there are our feathered heroes. 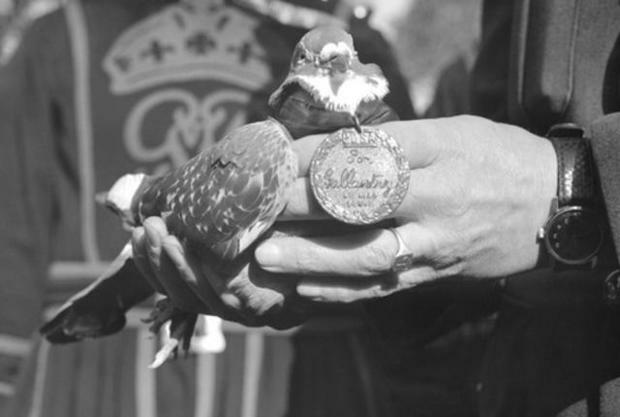 Quite a few carrier pigeons were honored for their service in war. Cher Ami, a messaging pigeon serving in the Argonne Forest with the 77th Infantry. Joe an American pigeon. In WW1, Cher Ami, a messaging pigeon was serving in the Argonne Forest with the 77th Infantry Division when the battalion of 550 soldiers she was with was completely cut off by German forces. After four days of heavy fighting, friendly artillery decided the battalion must have surrendered already and began firing on them. Ouch! Remember this WW1 could get on the cell and tell them to knock that crap off. They had to use carrier pigeons. Three were sent out and quickly shot down. Cher Ami, with a hole in her chest and a nearly amputated leg, got back into the air and delivered her message. Wow! 194 soldiers made it out alive thanks to her actions. Joe an American pigeon from Fort Monmouth, N.J. was in Italy. The British advanced on a town the Germans had abandoned and… that U.S. planes were about to strike. Radio communications couldn’t reach the airfield 20 miles away to tell them the German were gone. Joe saved the day. He carried a message, covering the entire 20 miles in only 20 minutes. His message reached the airfield just as the bombers were taxiing for take off. With only five minutes to spare, the bombing run was canceled, saving the lives of at least 1000 British troops. Joe retired to the Detroit Zoological Gardens until he died in 1961 at age 18. His body was mounted and displayed for years at Fort Monmouth, which closed in 2011. 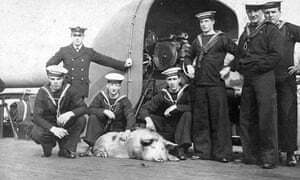 A pig, Tirpritz, was carried on the German warship Dresden in 1914 as a food source. The Dresden was sunk in battle with the HMS Glasgow off the coast of South America. Tirpitz escaped the sinking ship and swam to the Glasgow. The crew brought him aboard and adopted him as a mascot, named him after German admiral Alfred von Tirpitz and he spent a year aboard. Tirpitz was eventually auctioned off as pork, but in his final act he raised £1785 for the British Red Cross. His mounted head is on display at the Imperial War Museum in London. Tirpitz’s trotters were made into handles for a carving set that traveled with the Glasgow in World War II, giving Tirpitz the dubious honor of serving aboard the ship in two wars. November 7 through November 11 was, and still is, a special time for me. The 7th is my wedding anniversary. 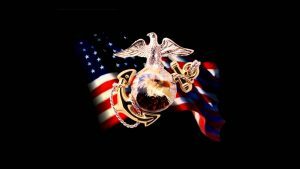 The 10th is the Marine Corps Birthday and the 11th is Veteran’s day. Hubs—Ed—was a Marine. I haven’t been able to celebrate with him for 15 years. But, I remember. I remember while in the corps he was gone for more of our special days and holidays than he was home. I remember after one of his deployments to Vietnam we didn’t have turkey or ham for years because the only hot meals he received while there was one of those. The taste and smell brought back memories of things he said he would never tell me. I remember the time we were in Madrid for our anniversary. He and a friend, who both had consumed way to much adult beverages, convinced the little band in the bar where we were spending the evening to play a version of an anniversary song. They enjoined all the patrons to sing. He kissed me and said, for all the times I wasn’t there. It was so unlike him I cried. When our son was with the first Marines into Bagdad he said he hated him learning what war was really about. 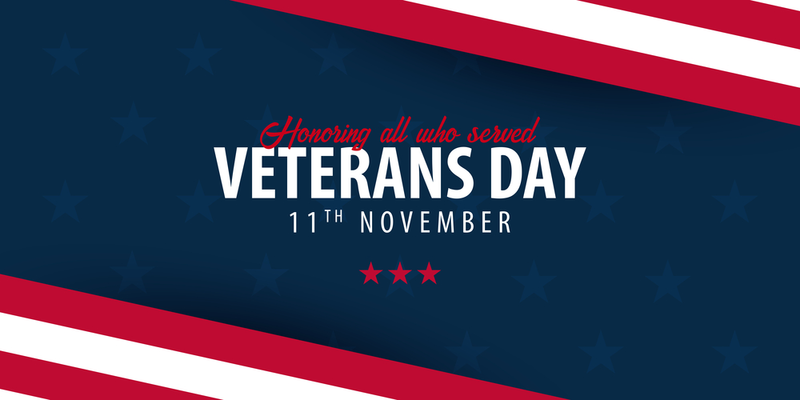 To honor my husband, I remember all the men and women who serve honorably around the world every day. One thing I do is check the FB page, Seal of Honor. There I can see the faces and read the names of those who have served. See daddies meet their children for the first time. See parents putting flowers on the grave of their young sons who will never have sons of their own. I not only think about the men and women serving, I think about their families. It’s true these days families are more in touch with those serving in combat zones and in faraway places. Service men and women Skype, call frequently, and tours are a few months at a time. But listen to me very carefully. The fear, pain, and loneliness the families feel every second, of very bit of the time their loved ones are away cannot be explained to anyone who has not experienced it. The thought the person you love can be killed in a firefight or step on an IED as you are drinking a cup of coffee is breath stealing. Or, as you breathe right now, another person takes his last breath for your freedom. To survive you shut something off. If you want to know what an unsung hero looks like look into the faces of a military family. Please, while everyone is remembering our heroes, take time to remember and honor the silent heroes, the families. The families who serve also, albeit by default, but serve they do. If you are so inclined join the families in a daily prayer to bring their loves ones home safe. Written on a plane headed to Kansas City. I love lighthouses. I grew up a block from the St. Augustine, Florida lighthouse. As a kid the grounds, with its old oaks were my playground. The light and the keeper’s house were basically abandoned after the Coast Guard automated the light. I’m not admitting to anything but…entering the structure was—cough—hypothetically possible. Hypothetically, I spent some rainy afternoons in the keeper’s house with a girlfriend or two, making out. Occasionally, of an evening, Clay, my best friend in high school, and I would entice our dates to climb in a window and go into the light. Not up to the top, just stay at the bottom where it was nice and private. I’ve only been to the top a handful of times. Not because it’s 219 steps to the top, but up past the first 50 or so steps I got a queasy, dizzy feeling. Like vertigo. Pretty sure it’s because of the heavy smoke smell permeating the walls. Accumulated from years of cigar and pipe smoking keepers. I also hear things, like phantom footsteps that kept me on the ground. One of the times I did go up to the top was with a girl. While we were up there she clocked my hard enough to cause a bloody nose. Why? She said I tried to push her over the iron stair railing. I didn’t lay a hand on her and I was pretty mad she said I did something like that. Anyhow, that’s how I got started with lighthouses. I went away to journalism school at the University of Missouri and believe it or not there aren’t any lights there. I was so used to the beam from the St. Augustine light sweeping past my window every minute and a half I had trouble sleeping. Tried setting a timer on a lamp to mimic the light. Roomie put an end to that real quick. After graduation I worked for a couple of small newspapers and freelanced. I could see the internet was killing print media and in my spare time—which had become more than my working time—I began to write the great American novel. Quickly learned I’m no Stephen King. Writing is hard. One night at the corner pub I was telling a friend my sad tale of woe and he gave me the name of a client of his looking for a ghost writer. Well, hell. I gave it a try and found out I could do it and do it well. I live comfortably off my earnings. So do two ex-wives. I recently traveled to Michigan to work with a client on his auto-biography. I visit to gauge the tempo of a client’s speech and get a feel for where they live. Knowing some about a client makes the ghost writing easier. The client spent his childhood on the upper-peninsula, or thumb, as the locals call it. A nice guy, nothing earth shaking in his life. Some interesting stuff, like his grandfather came to Michigan from Boston on an orphan train. We bonded big time when he tells me about a nearby haunted lighthouse he and his friends hung out in. I’ll be honest, I never thought about lighthouses in Michigan. But, get this, Michigan has more than any other state. The rocky shores on four great lakes have a hundred and twenty. Florida has thirty. Yeah. We shared a few lighthouse stories and a lot of damn good whisky. My business concluded, on a whim I drove my rental to a few of the Michigan lights. I was greeted at each by enthusiastic volunteers who treated me to the stats, stories and secrets of their wards. These bastions are pretty damn amazing. Most, built in the late nineteenth century on inhospitable rocky islands and desolate land, are pounded year round with treacherous weather. Yet, they’re still standing. Gotta tip my hat to those who built the towers without the heavy equipment we have today. One thing is the same as the St Augustine light, they smell of cigar and pipe smoke. I mentioned this to the woman—an aging hippie type—showing me around. She stopped dead in her tracks and put her hand to her throat, breathing hard. Thought she was having an attack. Eyes big as Oreos and in a halting whisper she told me only special people could smell the smoke. Alrighty then. I made my way to the next house where a great guy and his wife show me around. At the top of the light the lady, in a hushed voice, says, “The windows are clean.” I thought she was responsible and asking for an atta girl so I told her she did a good job. Although I wasn’t sure how she’d managed to do the outside. The Mrs. politely informs me she didn’t clean the windows, the ghost did. Okay. Moving on, I mention it’s too bad the smoke smell can’t be removed by cleaning. The couple give me a hard look. The Mr. chimes in that not everyone can smell the smoke from the light keeper’s cigars. As if I’ve given them a secret handshake into a paranormal club, tales of haunted lighthouses around the country pour from them. Strange lights, music playing, cries of women and sailors, heavy footsteps on the stairs. Cleaning ghosts, like the one here, who clean light windows and brass. Specters of women in flowing white gowns and men in pea coats. On the ground, outside and after the hairs on my body returned to their proper positions I was slapped alongside the head with a book idea. Thoughts swirled in my mind and I wasn’t able to think of anything else. I’ve heard writers speak of getting ideas this way but this is a first time experience for me. I’m excited. Excited about writing for myself. I can hardly sit still. The woman in the seat next to me keeps giving me funny looks. I gave her a big smile and tell her I’m going to write a damn good book about a haunted lighthouse. 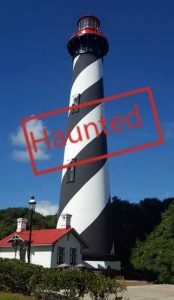 Currituck Lighthouse – Haunted Lighthouse Series. Currituck Lighthouse on the northern North Caroline Outer Banks was first lit on December 1, 1875 and is 162 feet high with 220 steps to reach the lens. It is a first order lighthouse, meaning it has the largest of seven Fresnel lens sizes. This light has a 20-second flash cycle (on for 3 seconds, off for 17 seconds), and can be seen for 18 nautical miles. The distinctive sequence enables the lighthouse not only to warn mariners but also to help identify their locations. 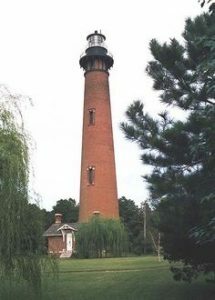 Currituck was the last brick lighthouse built on the Outer Banks. Its brick facade was left unpainted to distinguish the light from other lighthouses, and allows one to grasp just how many bricks it took to build. Like a million! Well, not the light itself but the North Room of the light keepers house. Of course, now the light is automated, but until the 1939 the light was manually operated, you know, by people, and their families who lived on the property. And it seems some of these people could still be hanging about. The Johnson family was the first to live in the keeper’s quarters. They adopted Sadie Johnson after the death of her parents. While living there, it was believed Sadie’s bedroom was the North Room. That is, until she drowned. There are two versions of her death. One says Sadie was often told not to play in the sand by the shore but paid the no attention. One day she didn’t return from her sand castle building. The next day her body washed ashore. Another version says she was swimming with her friends and disappeared. Since then it has been thought her spirit returned to her old bedroom. In both versions everyone assumed the drowning was a horrible accident. Until the next deaths occurred, that is. A lady visiting the keeper’s wife was given the north bedroom. She was stricken with a mysterious illness and died. Another keeper’s wife contracted tuberculosis and was confined and quarantined to the north bedroom. With family and friends kept away it’s said she lost interest in living and she too became a victim of the North Room. After she passed, so the story goes, her clothing and sheets were put into a barrel and kept in the room for fear of the disease spreading. After the automation of the lighthouse in 1939, the home fell into disrepair but the barrel remained in the North Room. Children from the village of Corolla were told not to go into the North Room. But you know kids. All they heard was go into the room. The kids opened the barrel and their parents found them playing with the clothes and sheets. The clothes and sheets were immediately burned. Is a supernatural phenomenon really to blame for those deaths? No one can say for sure. What is known is that the North Room remains a dark, foreboding area in the historic house. Many a guest has refused to enter the room, citing a chill hanging in the air and feeling an icy breath on their necks. The light keeper in the 80s said a guest who spent the night in the house said during the night someone, or something, kept trying to pull the sheets off the bed. Really? And she stayed in the bed? O. Hell no. Others have reported seeing visions. The current keepers says there are no ghosts. It is simply drafts and a creaking, groaning old house. Whether ghosts actually haunt the North Room is uncertain. For over a century, the room has seen the loss of loved ones and their presence may remain, keeping watch over the North Room. Owls Head Light. Haunted Lighthouse Series. 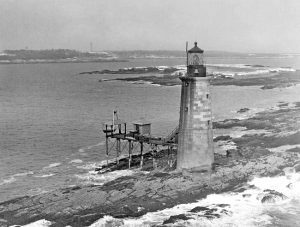 President John Quincy Adams authorized the building of Owls Head Light, Maine in 1825. Not a tall light but it stands on a cliff and is exactly 100 feet above sea level. And guess what? It’s haunted………. It has an awesome history of dedicated keepers and rescuing mariners. One of the most famous was when a schooner broke apart on the ice-covered rocks below the light. The light keeper organized a rescue party and they found a block of ice enveloping a man and a woman seemingly dead. But the rescue party brought the block to the kitchen of the keeper’s house and chipped away, slowly raising their temperature of the water and began to exercise their limbs. After two hours the woman showed signs of life. An hour later the man opened his eyes and wanted to know what was going on. There was a dog, Spot, that barked to warn sailors away from the rocks. 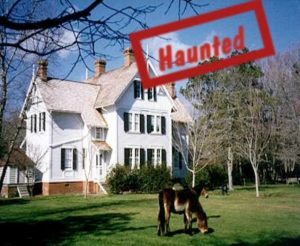 And… did I mention it’s also haunted? In the mid-1980s a light keeper’s wife spoke of the night her husband went outside to secure some construction materials. She felt him return to their bed or thought she did. She asked if all was well outside. Receiving no reply she turned over and saw only an indentation of a body in the bed next to her. The indentation moved, as if an invisible person was shifting in the bed. After a few minutes, she asked the visitor to go away so she could get some sleep. Right! Okay, I could have done that. But by phone from the next county. The next morning the light keeper told his wife that when he’d gotten out of bed the night, he saw a cloud of smoke hovering over the floor. The cloud, he said, went right through him and into the bedroom. The next keepers to take over the light were warned about the ghost but didn’t believe it. They chose a room said to be a favorite of the ghost for their daughter’s bedroom. For the entire time they were there the child had an imaginary friend she said looked like an old sea captain. Once, in the middle of the night, the little girl went into her parents’ room excitedly telling them, “Fog’s rolling in! Time to put the foghorn on!” Nobody had ever spoken of such things in front of her, the parents were mystified by the use of such jargon. Another common occurrence is the appearance of footprints in the snow, seemingly beginning from nowhere and going up the wooden stairs that lead to the lighthouse tower. On some occasions the keepers find the door to the tower open, the lens and brass inside freshly polished. Um… I want someone to clean my house by draw the line at a ghost doing it. What about you? Ram Island Light. Hendrick’s Head Lighthouse. Haunted Lighthouse Series. 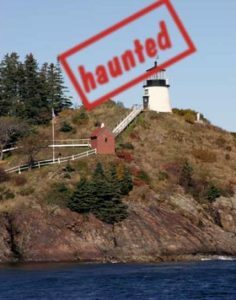 The ghost of a beautiful young woman dressed in white walks the shores of the beach near Hendrick’s Head Lighthouse, Southport, Maine. Is she the ghost of a woman who was found drowned there one morning, or is it the mother of a shipwrecked baby? In 1871, a vessel went aground on the ledge about a half mile off shore during a March gale. The keeper had no way of getting out there, so he watched helplessly as the ship went under. Some of the debris washed ashore, and the keeper and his wife went to pick through it. The keeper spotted what looked like two feather mattresses bound together with rope. He called his wife over, and they hauled it in. Untying the rope, they found a wooden box wedged inside, which was making strange noises. Opening it, they found an infant girl. Apparently the mother had done the best she could to save the baby, and succeeded. The keeper and his wife rushed her to the house where they dried her, warmed her and fed her, and kept her as their own. But the real mother, filled with grief and longing, may be the ghost who walks the beach. What do you think? Real or stories. I believe it. What I wonder is why haven’t these women recently been seen. No one to help or did their spirit get closure? 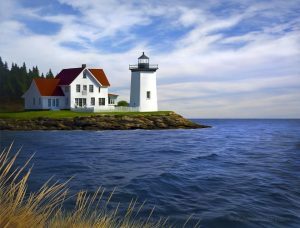 The Seguin Lighthouse is in the Gulf of Maine on Seguin Island, south of the Kennebec River. Established in 1795, it is the second-oldest of Maine’s coastal lighthouses. The light station stands on the island’s highest point, and includes the lighthouse itself, the keeper’s house, fog signal building, a small oil house, and a 1006 foot tramway for bringing supplies from the shore to the site. The light, built from granite blocks, is 53 feet tall and 180 feet above sea level making it the highest in the state. The first tower was wood frame completed in 1797 and replaced by the present tower in 1857. This light has quite the history and of course, it is haunted….. Starting with the history part, on September 5, 1813 the epic sea battle between the HMS Boxer and USS Enterprise took place near Seguin. Yes. The name USS Enterprise has a long, glorious history. More than a hundred light keepers have served at Seguin. There has been several women assistant keepers. Not a common thing in those days. Going through the list of keepers names I found it odd that some were removed from their position. For what reason? I can understand why many resigned. That island is pretty small and is said to be foggy fifteen percent of the time. The fog horn is so loud it can be heard fourteen miles away and keepers swear it has blasted birds from the sky. BTW I don’t particularly care for fog. Those who lived there had to be pretty self-sufficient. Electricity didn’t arrive until 1953 and from what I can tell it was kinda iffy at that. Did those that resigned get bored? Couldn’t take the isolation or get tired of being so self-sufficient? Now here is where the weird stuff begins. Near the island, in July of 1875, a sea captain and ship’s crew reported seeing a monster that came to their boat and put its head over the rail. They struck it with a pike sending it back into the water. A few days later another boat reported seeing the serpent floating along occasionally raising it head to look around. WTH? Many believe that the pirate, Captain Kidd, buried his gold and silver treasure on the island. In 1936, for a year, a man dug up the place looking for it but found nothing. Sometime in the mid-1800s a murder suicide took place. A light keeper bought his wife a piano. Ah. Nice guy. She played the same tune over and over for hours upon hours until it apparently drove the keeper insane because he took an axe to the piano, his wife and himself. Eww. Doing yourself in with an axe? The mind boggles. The spooky thing is on quiet nights, the crews of ships going by the island say they can hear the tune playing over and over and over. A young girl died and was buried on the island and many report still seeing her running up and down the stairs. Some have even heard her laughing. There are other reports of items being moved or going missing, jackets being taken from hooks and thrown to the floor, and furniture rearranged. When the Coast Guard was packing up to leave the island in 1985 an apparition in oil skins begged a warrant officer to leave his furniture and home alone. The next day as the furniture was being loaded on a boat, chains broke and all the furniture fell into the ocean. Coincidence? Don’t know but my new rule is if a ghost asks me to leave his furniture and home alone, I’m not arguing. St. Augustine Lighthouse. Haunted Lighthouse series. celebrating its 144th birthday this weekend. The St Augustine Light is an active light. It stands 165 feet above sea level, with 219 steps to the top, and overlooks the Matanzas Bay and the Atlantic Ocean from Anastasia Island. It is the first Florida light commissioned by the American government in 1824 and has a first order Fresnel lens now lit with a 1000 watt bulb. The light is St. Augustine’s oldest surviving brick structure, and stands where, soon after arriving in the mid-1500s, the Spanish built a watchtower. A spot to watch over the town and see out to the ocean for 450 years. In modern times during World War II armed Coast Guardsmen used the tower to watch for enemy ships and submarines. This light is also said to be haunted. Having grown up a couple of blocks from this light I can say I’ve been inside more times than I can count. To the top only a handful of times. I’d say half of those ‘visits’ were after dark. Do I think it’s haunted? Well, let’s say during the day I’m a skeptic. At night – I believe. Mind you, I’ve never seen anything, but there is a feeling. That’s the only way I know how to explain. Who are these ghosts? There was a suicide by hanging and a man who fell from the first tower might be still around. A keeper and the wife of another keeper died there. Three children died in an accident. Pirates were imprisoned and excited there. Some are buried on the grounds. Then there is the story about the original owner of the lighthouse who had the light taken from him by eminent domain and threatened never to leave. Some say his spirit still walks the tower late at night. Anyone of these men could be the cigar smoking ghost reported in the fuel house. People say they’ve heard the laughter of children in the tower, and one has been seen, wearing the same blue dress she drowned in. Some have glimpsed a shadowy figure in the tower, a hand coming through the tower door and furniture moving around by itself. I will also say if I’d seen anything I would never go back. The feeling in there is creepy enough. Dozens of YouTube videos online are also devoted to paranormal events here. 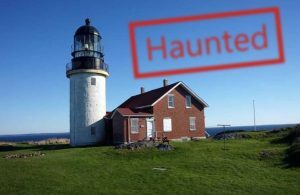 Other researchers say the light is not haunted. Everything can be explained.